KEF confirmed as official supplier to Aston Martin Racing | What Hi-Fi? KEF and Aston Martin Racing have announced a partnership deal that gives KEF official supplier status and the right to use the Aston Martin Racing official supplier logo. 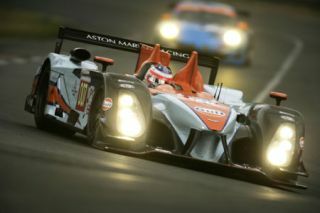 Aston Martin returned to international motorsport in 2005, competing in the prestigious Le Mans series. The KEF logo will now feature on the famous 007 and 009 racing cars. KEF will celabrate its 50th anniversary later this year. "My team and I are delighted to be working alongside Aston Martin Racing," says KEF's UK managing director Steve Halsall. This is not the first time KEF has been involved in motorsport. In 2009/2010 the British hi-fi company was a technical partner to Prodrive, one of the world's leading motorsport and automotive technology companies (which runs the Aston racing team). This latest deal runs from June 2011 to December 2012.